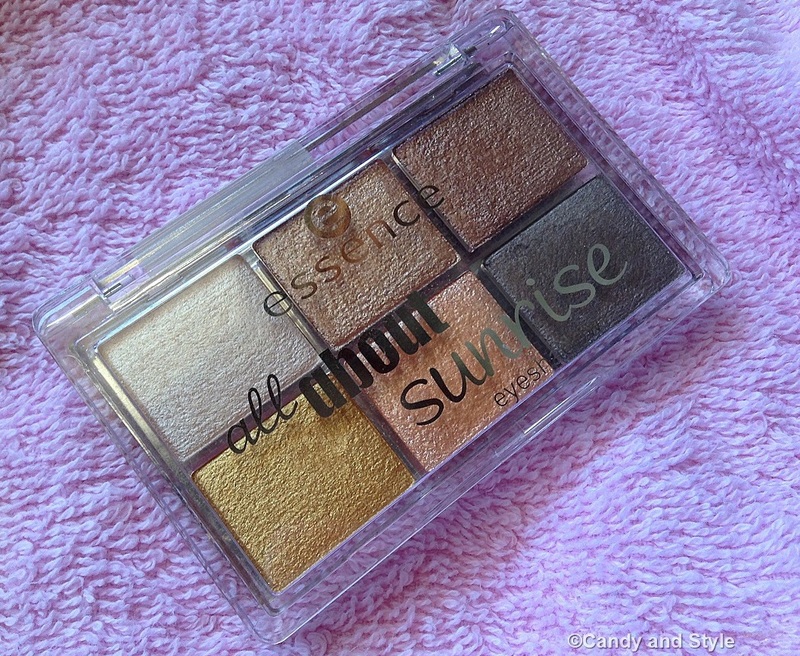 I'd like to share with you my new Essence palette, "all about sunrise". I was so eager to test it since everywhere I've read and heard positive feedbacks on it, and, in fact, it didn't disappoint my expectations. It comes with six eyeshadow shades that really remind the sunrise colors: pearly and metallic, except for the last one, which is more satin. The texture of each pod is super glowy, smooth, easy to apply and blend even with the finger; it is pretty long-lasting and does not clump up in the eyelid crease, even without a primer (which generally I don't use). I feel to suggest the palette as those are basic tones suitable to all the eye colors and all the year around, plus the quality is quite high in comparison to the very cheap price. I haven't tried anything from that line yet. I love the colors. Wow, how did you make your eyes like this? I must say that these colours suits your eyes colour very much! 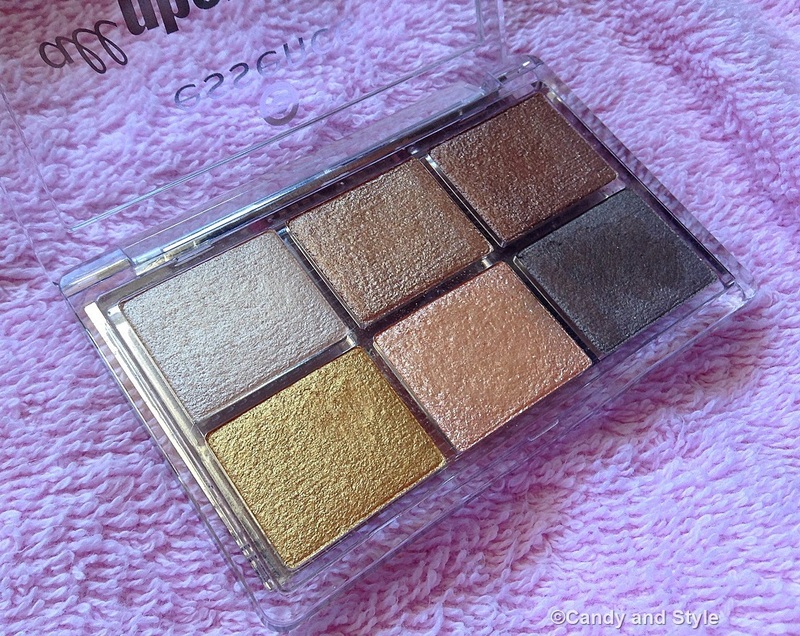 Usually I don't use eye shadows but those look shiny, smooth and easy to apply indeed! There is essence in the shop I usually buy cosmetic, so if I see them I'll try them on. Thanks for sharing, Lilli! ciao lilli, questo tipo di make up naturale mi piace molto, dona luminosità senza essere eccessivo, brava! Bellissimi i colori, l'avevo vista ma non l'ho comprata perchè non potendo vedere l'effetto non ero sicura, favolosa, la voglio!!! Ecco questa la vorrei proprio provare, anche perché mi devo decidere a usare (e imparare a usare bene) gli ombretti! Bellissimo il make up che hai realizzato, luminosissimo! Belli questi colori, sono toni che utilizzo spesso! Eccola la mia make-up artist... bellissima questa palette, ma vorrei anche saperla usare come te!!! Hi Lilli, I have also read several reviews about Essence and all have positive comments, you chose will look great and are perfect for any occasion, to remind me a lot of naked Urban Decay. Kisses hun. Lilli tesoro che colori incantevloi in questa palette mi sembrano perfetti per la nuova stagione! Queste tonalità di colore sono molto belle! I love the shades as I like earthy colours! And your eyes are so beautiful! I haven't tried this palette, but I'll keep it in mind. Have a nice evening Lilli! p.s. voglio provare questa palette! Io purtroppo non mi sono trovata bene con i prodotti essence, mi sembra che te l'avevo già scritto ;), però tu sei bravissima a creare delle belle sfumature! 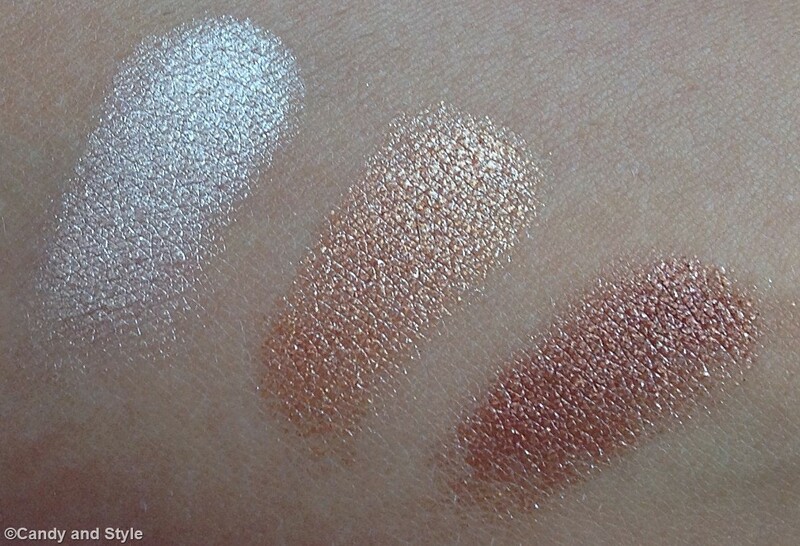 All the shades are so beautiful <3 This would be a perfect palette for evening eye makeup!!! Oh mamma che stupenda questa palette! :) La adoro, Lilli! ...questa palettina è davvero tanto carina...perfetta per il periodo...e bella pigmentata!!! Uso diversi prodotti essence per le unghie...devo provare anche altri prodotti!!! Indeed these pretty metallics are reminiscent of the sunrise. It's a good thing you were able to track this palette down Lilli! It sounds like such a great value and the look you created is very pretty! I bet you can probably come up with so many variations with these colors. Enjoy! Che bei colori questa palette! Wow Lilli, your eye-make-up looks so beautiful. The colors a great for you and you made the eye-make-up just perfect, like an make-up artist. The colors of the palette are absolute my colors. We have essence in germany too, i should try the colors. Essense has fair prices. Vi auguro una spendida sera. The palette is beautiful! The colours really suit your skin. Bellissimo questo make up naturale! Un bacio tesoro. Adoro questa marca!!! prodotti molto buoni a prezzi accessibilissimi!! Bellissimo questo trucco! Ciao Lilli, passa a trovarmi. It looks so good. I will search for the palette on Essence stand. È una marca che mi piace per l ottimo rapporto qualita prezzo, il che secondo me è molto importante..
C'è una MUA i n te e tu non lo sai! Questo make up ti è venuto benissimo, la palette mi piace molto ma tu hai saputo dosare bene i colori! 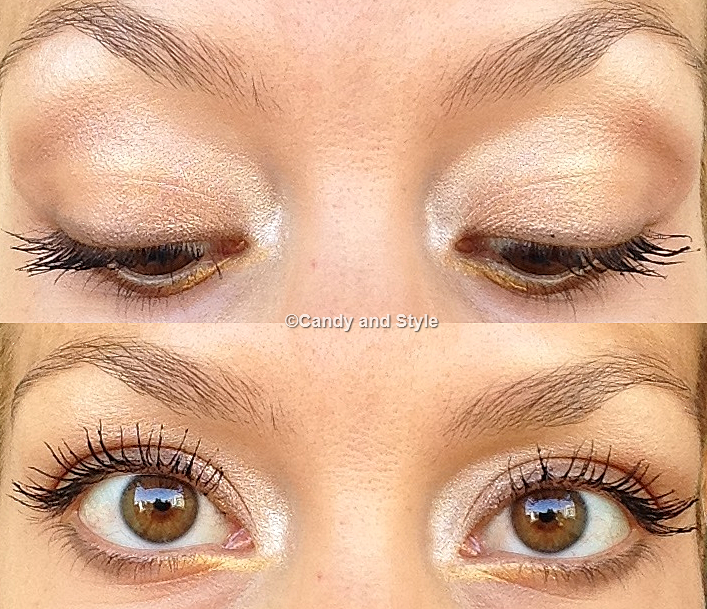 These natural colour are my favourite, good thing there is shimmer on iIt so that it will brighten up the eye lids. Great choice Lilli. Looks fab on you. Non ho parole, già dalla prima foto ho pensato che questa palette fosse L'AMORE! colori luminosi e scintillanti, come piacciono a me. Li preferisco alla versione matt. Love the pretty look to your eyes, the pearly and metallic look are fabulous. You have such beautiful eyes....and the color palette suits you very well. BTW...I love your cherry & blue ensemble in the previous post....couldn't post my comment anymore! These are such pretty shades - I love Essence, it's such great value! E' vero ne parlano tutti benissimo e per questo è introvabile! Il make uo che hai creto è stupendo e ti sta molto bene! Belli questi colori che poi sono quelli che secondo me ti donano molto, i dorati non sempre donano a tutte ! Hi Lilli, the color look so nice on you, very pretty. Hi sweet Lilli! I hope you are great, dearest! 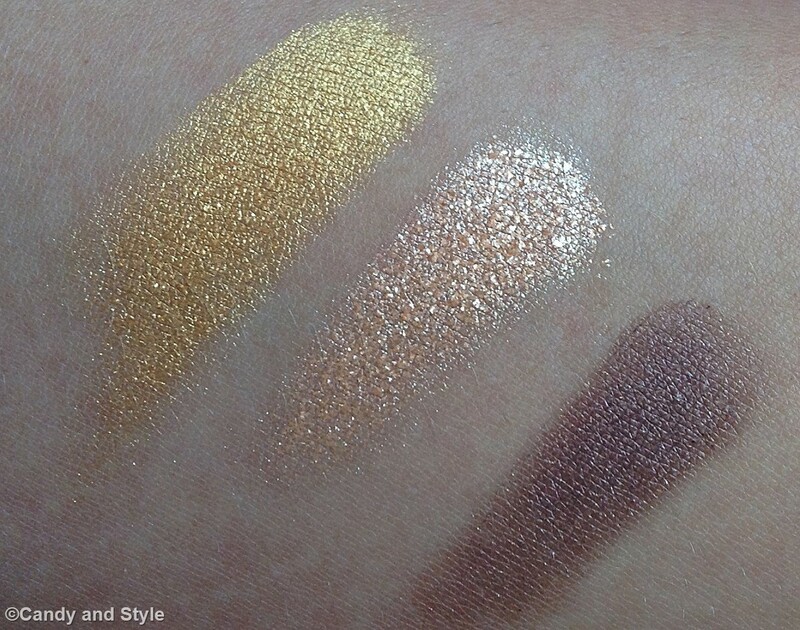 love your choice of beautiful sunrise palette- great shimmer and stunning make up! cherry red and denim - totally in love with this gorgeous look! What a lovely bright outfit that suits your skintone so well. This vibrant colour compliments denim so well and your ballerina flats are adorable! you had me on the headnotes of this perfume - you'll smell like beautiful summer for sure! just simply love the wonderful images of your magical summer - amazing settings, chic outfits and delicious food. Well done, babe! you look like a real goddess in this amazing combo of breathtaking dress and cotton candy pink floral headband, boho chic, graceful and princess-like vibe for sure. Amazing, doll! I have never heard about this Italian brand, Lilli, but I'd love to give it a try. I love perfume and complementary body lotions! what a beautiful polka dot dress you have selected for this look, babe! I really loved how you styled it with the cutest red accessories! great job! wonderful photos! I so much dream about visiting the flabergasting Sardinia one day, for it must be a really beautiful place - paradise like, for sure! frills and flast could never go wrong this blue dress is really elegant, polished and romantic! date alert, perhaps... :) , I loved the way you styled your hair ! gorgeous! I wish you a super fun week and upcoming weekend dear! missed you tons! bellissima palette, adoro questi colori! non ho mai usato Essence! Those colours look really great on you eyes! Lilli, those metallic shades are gorgeous! Love it on your eyes! Ciao Lilli, avevo già letto un po di recensioni su quetsa palette, e sui tuoi occchi fa davvero un figurone!! mi piacciono le tonalità gold! Wow, this palette is so beautiful. I like those colors. Especially the way you mixed them on your eyes. Perfect!